William Richard Morris was born at Worcester on 10th October 1877. The family, which was relatively poor/middle class, moved to Oxford where Morris attended school until 15 years old. Morris set up a bicycle business which prospered, mainly due to the excellent quality of his machines and careful control of costs. He was also highly successful at racing bicycles and won many prizes. In 1902 Morris made a motor cycle, simply an engine fitted to a bicycle frame. In 1913 W R M Motors was formed to manufacture cars and in 1913 the first car, the "Oxford" was produced. All components were purchased from other manufacturers. During this period Morris visited America to learn the secrets of mass production. He also negotiated a contract to purchase engines from America at a price that could not be matched by any English company. His new car, the Morris Cowley, was a success and formed the basis for the Morris empire and fortune. The first Morris Minor was launched on the 1st September 1928 and was released for the 1929 season. It was designed to compete against the highly successful Austin 7. The Morris Minor was initially a disaster with an over-complicated Wolseley engine and a light fabric covered body with wool padded corners. The birds in springtime found this an ideal lining for their nests and picked holes in the fabric to get at the wool! The car was redesigned to provide a more rugged and less costly vehicle with a new and simple engine, apparently copied from the new Ford Eight! The 1930's were marked by management problems largely caused by Morris spending less time managing his business and long periods wintering abroad. He was particularly fond of long sea voyages and liked to visit Sydney, Australia. He strongly resented any major decisions being made without him being present. While Morris had a gift for choosing the right men for the right jobs, he rarely left them alone to get on with the job. This often ended in a quarrel with the manager or executive departing. Both Austin and Morris Motors merged in 1952 to form the fourth largest car company in the world. After a short illness William Richard Morris died on 22 August 1963. It has been claimed that Morris was not a great originator of new ideas, he was a mechanic more than an engineer. But even more so he was a shrewd businessman who grasped the ideas of modern mass production and strived to produce a car that the ordinary motorist wanted. However, Morris was unable to allow anyone to stand within his shadow or to delegate power in full. An example of this inability to relinquish any of his power over the company was his decision to employ Leonard Lord, who would be responsible for the two most successful inter-war cars produced in Britain and would save Morris Motors financially during this period. His employment was terminated when Lord requested a share in the profits of the company. In turn, Lord would wreak revenge destroying the power of the Morris empire when its founder weakened in his old age. The Morris Minor was not developed in the main drawing office at Cowley, but in a little self contained workshop in an isolated corner of the factory with a small body shop attached. It was developed without the confidence of the senior management of the company and probably without Lord Nuffield (William Morris) being aware of its development. The car was originally designed to have a flat-four side-valve water cooled engine. The engine was to have cylinder barrels that could be readily removed - somewhat on the lines of a certain German car! Experimental engines were built by Morris Engines of Coventry and fitted to some of the prototype cars but were never fitted to production car. The first prototype was called the Mosquito and was completed on the 1st September 1943 and was coded EX/SX/86. It was designed to have a front bench seat and a steering column gear change. The first prototype to be called the Minor was a 2 door completed on 14th June 1948 and the last prototype was completed on the 2nd September 1948. There were a total of eight prototype cars built before production of the Minor commenced. The old faithful 8 hp side-valve engine (from the Morris Series E) was fitted to the production cars, to avoid design problems and the cost of developing a new engine. This was unfortunate, since the 8 hp engine resulted in the car being underpowered - especially for the overseas market. It has been claimed that the styling of the car was greatly influenced by American styles. It has been said that the Morris Minor is the car that typifies "Englishness" and yet the designer was the son of a Greek father and a German mother, and the style was based on current American cars. Most of the American cars from the late thirties and forties have similar curves to those seen on the Morris Minor. The styling of General Motors cars seems to have been particularly influential on the Minor's design. The 1941 Packard Clipper had flush front and rear wing lines with flared out door sills, like those on the Minor. Flared out door sills were also seen on 1942 cars, such as Hudsons and Chevrolets. When Lord Nuffield first saw the Morris Minor he was furious, calling it a poached egg and many other uncomplimentary names! Lord Nuffield was strongly against the car going into production and even refused to drive the car for publicity purposes when the car was officially launched. 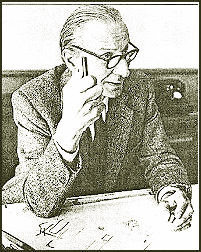 Lord Nuffield refused to speak to the designer, Alec Issigonis for 11 years, and then only after a million Morris Minors had been sold. However, Lord Nuffield did have the grace to finally thank Alec for his work! The first Morris Minor came off the assembly line on the 20th September 1948 just in time for the Earls Court Motor Show in October 1948. Morris Motors unquestionably had the finest small car in the world with the Minor, it was one of the first cars in its field to handle well. However, there is little to suggest that the Nuffield Organisation appreciated the quality of the car. The export market was never fully exploited, particularly with regard to promoting the car and fitting a more suitable engine. The Morris Minor was the brainchild of Alec Issigonis, born in Smyrna Turkey in 1906. Issigonis completed a three year mechanical engineering course at Battersea Polytechnic. He joined Morris Motors in 1936 and worked on the design of suspension systems. He was particularly interested in fully independent suspensions and steering systems, and the dynamics of vehicles that influenced road holding. It has been claimed that Alec Issigonis was responsible for the design of the entire car down to the little knob that opens the glove box!